Looking to boost its technological might, the Russian government is seeking to attract small businesses to defense projects. More and more small businesses are joining the ranks of defense contractors: According to the latest official data, companies with around 100 workers or fewer already manufacture 37 percent of all arms. This leaves a lot to be desired though, as U.S. small businesses account for 50 percent of defense orders there. International experience has shown that the defense industrial complex can provide a powerful impetus to technological development and increase the share of SMEs in the national economy. Moreover, given that virtually all Russian small defense contractors used to be linked in one way or another to military agencies or research institutions, the government’s initiative appears to make a lot of sense. “SMEs account for 37 percent of state defense orders today. Yet this percentage is growing at a moderate pace: It was 23 percent in 1997. Half of defense contractors were founded by former research institute employees, and the other half maintain close ties with the Ministry of Defense,” says Igor Skachkov, adviser to the managing partner of Sberbank’s in-house consulting firm Strategy Partner Group. Entrepreneurs say they would have been more eager to enter this rather peculiar area had the terms for working for the government been better. Companies mostly complain about the opacity of relations with their customer (i.e., the Ministry of Defense), the lack of clear rules for completing orders and the legendary uncertainty about deadlines. According to official data, Russian state defense orders totaled around $31.4 billion in 2009, $34.5 billion in 2010, slightly more than $22 billion in 2011, and $27.6 billion in 2012. “The market for state defense orders is very peculiar, with essentially no regulatory mechanisms in place. Plus, small and medium-sized companies that operate there receive zero support. Take, for example, tenders for new product development: The winner gets all development costs reimbursed, while the losers have to absorb all their own costs. In the West, for instance, development costs are reimbursed to all tender participants. Why not introduce the same thing here in Russia?” says the CEO of Integral (an R&D engineering company with a 60-percent share of defense orders in its portfolio), Vladislav Shipilov. Apart from the lack of clear-cut rules, there is the problem of the untimely awarding of defense orders. The standard routine for defense contractors is to sign contracts in May or June in order to receive financing. Yet companies cannot sit idle for half a year before signing a contract and then manufacture everything they are supposed to in the remaining half of the year. This leads either to layoffs with subsequent hiring early in the year, or to the need for raising loans and associated extra expenses. Thus, when the Ministry of Defense accuses contractors of inflating product costs, it is completely accurate. For all those reasons, according to the Audit Chamber, manufacturers lost half of all planned contracts with the Ministry of Defense in 2009, simply by failing to sign them on time. A couple of years later, in 2011, the situation was scarcely better, with contracts for certain types of weapons signed in November of that year. 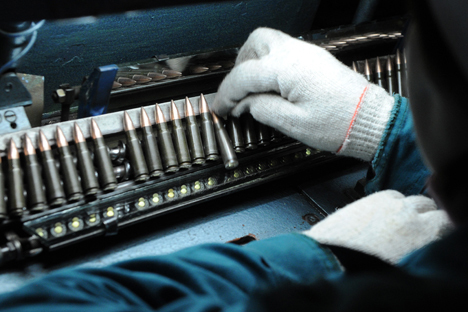 Manufacturers have demanded that the Ministry of Defense sign contracts for at least three- to five-year terms, at prices that take account of inflation, rising energy costs and so on. Remarkably, the government agrees with all these demands and intends to meet them. “The legal framework for defense orders that are expected to become longer-term must be improved. A new system of long-term contracts should be put in place where companies would be able to earn economically reasonable margins. While we hold serious positions on the global arms market – second place in terms of sales volume – it’s increasingly difficult to remain there, year after year. The upshot: It is necessary to move forward all the time and develop new, competitive products. Nobody is going to take pity on us. The moment we relax, other nations will overtake us; you know full well who’s breathing down our neck,” Russian Prime Minister Dmitry Medvedev told a recent military and industrial conference. Manufacturers welcome the government’s efforts to put defense contracts in order, both in terms of resolving the existing problems and planning for the future. “We have no idea what direction to follow going forward, what the state might need over the next five to six years. In this sense, we would have greatly benefited from a single database of the Ministry of Defense’s needs for new types of arms and technology. We would have known then in what direction to take our R&D,” says Shipilov. Moreover, experts point out that, faced with clear rules of the game, former researchers would start developing new technology again, contributing to a revival of Russian industry much more effectively than through establishing technology parks and attracting foreign companies.